Jamie Cullum writes a new song with Stephan Moccio & Hudson Thames. Check out the video below! 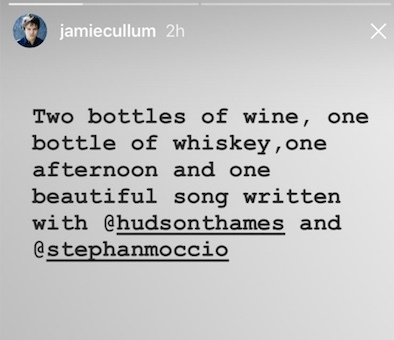 Last week Jamie shared an Instagram story that after two bottles of wine and one bottle of whisky, he wrote a beautiful song with Stephan Moccio & Hudson Thames. Here is the video story from Stephan Moccio. Hopefully, we will get to hear it soon!